This gallery of high heel shoe art prints feature images that are now available as mugs, mouse pads, T-shirts, and stamps. Please click on the photo thumbnail to see a larger version, prices, and background story for each print. 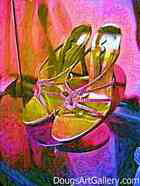 Shoe art of four ankle strap high heels in assorted colors titled "If the shoe fits buy one in every color" by Doug Dourgarian Purchase this art print on 11x17 inch 100% acid free heavy duty premium paper.$120 USD. This is the second in the series from Rome's fashion shopping district. Lots of fine leather, high heels, and Italian designer fashion, and part of the Ankle Strap High Heels Gallery 1. Not a high heel but this is not considered a sensible shoe. This black embroidered also has a bow on the outside heel. Purchase this print on 11x17 inch 100% acid free heavy duty premium paper.$110 USD. These designer decorated flip flops had lots of bling bling type glitter. Purchase this print on 11x17 inch 100% acid free heavy duty premium paper.$120 USD. This print is rich in color and the shoes are elegant ankle strap high heels and a welcome addition to the Heels Gallery 1. Inspired by pop shoe art of the 1960s, the Purse Forum was an idea from a Purse Party, it is a color print featuring four purses in the Andy Warhol style display. These are not ankle strap high heels but best belong here in Heels Gallery 1. Click here to leave Art of High Heels Gallery 1 Online for more links to artistic styles, artists and their online art galleries, art prints and art posters. Browse the links found at the bottom of Home Page.